The stately saguaros stand tall with their friends the fuzzy cholla, classic prickly pear and spiky ocotollio cacti surrounding them. Their “arms” reach toward the deep blue sky as if to greet us. A forest of human looking, pleated saguaros, welcome us as we enter the west section of the Park from the north. We booked a “web special” at the lovely Loews Ventana Canyon Resort as we were leaving Texas (our last National Park adventure). We thought visiting Saguaro National Park – on the east and west sides of Tucson – would be a warm, sunny way to spend New Year’s. We continue on the newly re-opened and freshly grated dirt Golden Gate Road, through a fantastic forest of 150-200 year old saguaros (“g” is silent). We stop at the Sendero Esperanza Trail (recommended in our “National Geographic Guide to the National Parks”) and take the short 3.4 mile hike through the Sonora Desert up to the Hugh Norris Ridge Trail for a great vista. Next time we’ll add on the additional 4.4 miles up and back to Watson Peak. A few more miles down the road we enjoy a very dense clustering of saguaros from the Red Hills Visitor Center. Although definitely worth the stop, we pass on visiting the Arizona-Sonora Desert Museum – an outdoor desert botanical garden – since we explored it while I was on a consulting project in Tucson. As we exit the west section of the Park, we see the rain clouds coming and feel the temperature dropping. Our New Year’s in the warm desert sun is not to be. 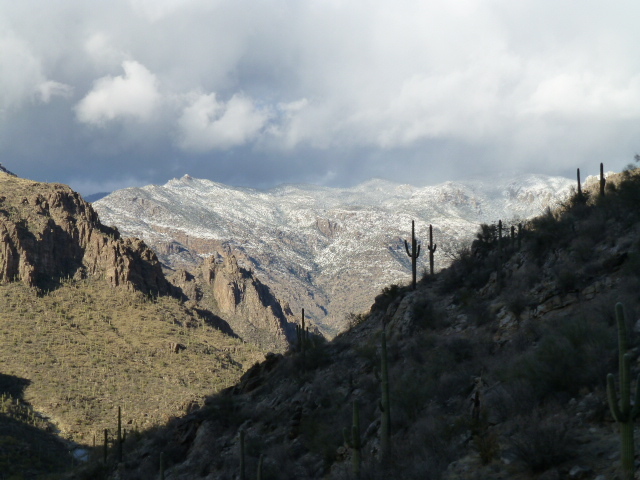 Today we wait for the rain to let up, bundle up and head for Sabino Canyon, a very short drive east from the Resort. Due to a heavy washout that destroyed 80% of the trees in the area, the Canyon was closed for two years. So, we are happy to get all the way into the Canyon in the open air (aka cold) shuttle. We decide to hike the 5 mile “Phone Line Trail” versus riding back down in the cold shuttle. It’s a fantastic trail hugging the rock walls 1,000 feet above the Canyon floor. Saguaros thrive in this rugged terrain while the fall colors of the cottonwood trees line the creek below. Despite the snow flurries, we stay plenty warm on this trail. New Year’s Day is a sunny but chilly one. We head to the eastern section of the Park. This area has an eight mile hilly paved loop. Cyclists love it. Otherwise, this section is only accessible via trails which appear to be heavily used by Tucson residents. We select the Bridal Wreath Falls trail – 5.5 miles roundtrip with 1,100 feet of elevation gain. The well-established trail climbs through saguaros and Sonora Desert vegetation up to grasslands and finally ends among juniper trees. Despite the rains, the falls are a small trickle barely audible or visible. The rocky “wreath falls” are still a beautiful spot for a snack. Everyone is very friendly and happy to be starting their new year on the trail. Our fantastic hike is followed by a very special dinner at the Hacienda Del Sol. Created in 1929 as a desert retreat and former elite girl’s school; it is now a beautiful Spanish style resort. The Grill is a must-visit. I enjoy a crab cake salad, followed by wonderfully prepared scallops. Tom enjoys the tomato bisque soup with lobster crostini followed by lamb chops and lamb sausage. Excellent service while overlooking the twinkling lights of Tucson completes the experience. Our final morning, the sun becomes a bit warmer. I enjoy the beautiful pool nestled into the Catalina Mountains and Tom grabs another great hike up Ventana Canyon. Despite the inclement weather, we managed three fantastic hikes amid the grand saguaros and a very special dinner all while staying at a fabulous resort. And, we begin the new year with our 20th National Park stamp – yahoo! Jan 1 What is Big Bend National Park? Where is Guadalupe Mountains National Park? And, Who first explored Carlsbad Caverns National Park?